The High Grove Community High Grove is a fantastic gated community, it has 164 villas in Mediterranean style, lovely red tiled roofs, cream exterior walls and block paved pools making it unique in both style and appearance. 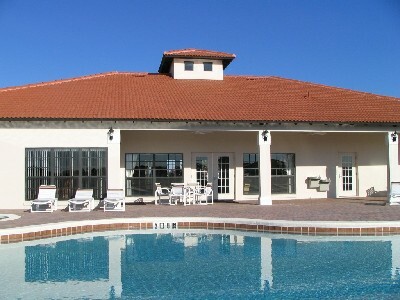 High Grove is in a great location situated on Highway 27 at the junction of the 192, 6 miles to Disney or approximately a 10 minute drive. There are restaurants, shops, and supermarkets including a 24-hour Wal-Mart all within a mile of the community. If it’s fishing or golf you are interested in these can be found within a couple of miles, a great location for all at this top class community. The clubhouse This is opened and manned from 8am to 8pm, fancy an early morning stroll along there to enjoy a complimentary tea or coffee with the morning papers, a great start to the day. There are activities arranged and you may also find a social event taking place when you are visiting so do pop in and check out what is being organised, there is a notice board and say Hi to the friendly staff. If you require a shuttle service either to the attractions or the airport this can be arranged at the reception area too. The clubhouse offers a luggage storage service for guests who have to check out early but have a later flight. As you enter the clubhouse there is the reception on your left, here you can purchas sun creams, t-shirts and sweatshirts. There is also a great seating area if you fancy reading the complimentary papers with a tea or coffee. Computers and Internet There are two computers with desks in the reception area with free Internet access for your use. Cyber sitter has been added to the computers to restrict access to unsuitable sites for our younger visitors. There is also wireless Internet access if you fancy bringing along your laptop. A printer and fax are also available for a nominal fee. Games Room In the games room there is a pool table and foosball table along with books and games, which is for High Grove visitors use. 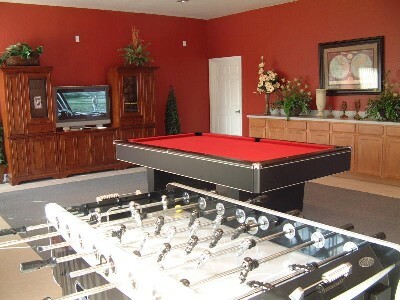 Fancy a game of pool, challenge fellow visitors to a game, all great fun and the clubhouse does organise games too. There is a large TV in here, which has cable TV. Arcade Room This is a great room to keep both adults and children entertained. 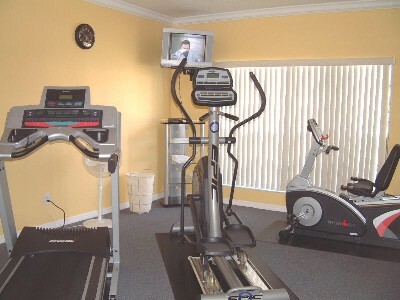 The Gym & fitness Room has three pieces of equipment, treadmill, exercise bike and cross trainer. Why not have a work out in a fully air conditioned gym and you can watch the TV too whilst doing all that exercise. Towels are also available for your use whilst using the gym. Maps and Coupons There are lots of brochures and maps on the attractions for you to look at and take away. Don't forget to pick up the discount coupon booklets too. Community pool and spa This are situated to the rear of the clubhouse. This is a great place to meet up with people. There are sun beds, table and chairs, sun umbrellas and outdoor table tennis. Towels are available for your use whilst using the pool area. Children under 13 years of age must be supervised in the pool area. 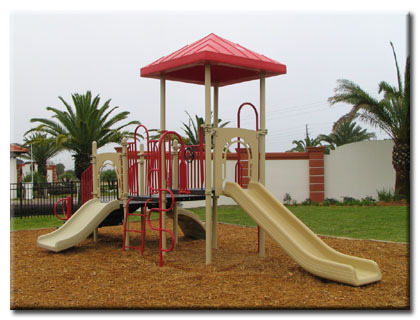 Children's play area Situated just across the road from the clubhouse, take a seat whilst the little one's have a play in this fun area.